Remove improperly formatted email addresses, duplicates, and syntax errors. Doing so will increase your deliverability rate. An email address that hasn’t seen any engagement in opens or clicks within a predetermined time frame, (rule of thumb is around six months), should be removed from your list or targeted for a re-engagement campaign. Use an online email validation tool to validate each email address to confirm it’s [sic] deliverable. While we are fine with the second recommendation on the list, the first and last recommendations have us shaking our heads. The “expert” here seems to be suggesting that these are things you are going to have to handle on your own. Wouldn’t it make more sense for your ESP to handle these things for you? Let’s look at them one at a time. 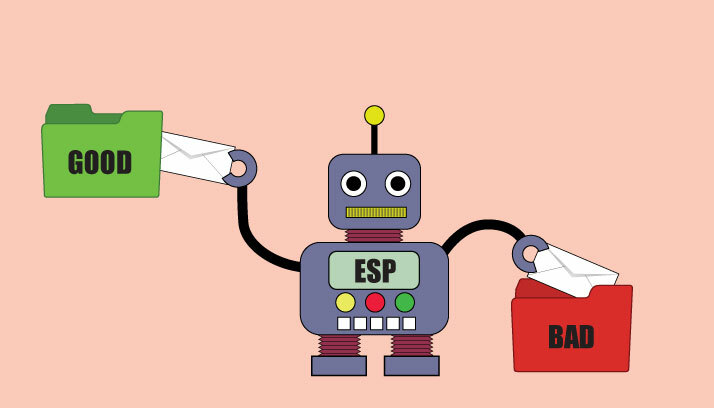 If you already have an established email program you shouldn’t have any “improperly formatted email addresses, duplicates, and syntax errors.” These should have been filtered out when the data was first imported into your ESP. Why would any ESP leave an obviously bad address, like bob@bob@aol.com, in your database? Perhaps if you have to pay by the address there’s some incentive for the ESP to keep these obvious mistakes in the database, but that’s a terrible way to make money. You are going to want an email marketing solution that is able to recognize these obviously bad addresses and remove them as soon as they are entered into your subscriber list. While bob@bob@aol.com is a bad email address because it contains one too many @ symbols, its domain, aol.com, is legitimate. But what happens if the syntax is correct, but the domain is wrong. There’s nothing wrong with bob@zygodrillbits.com as an email address, except that there is no such domain zygodrillbits.com. Good email marketing software will also check the domains and remove the bad ones from the send list, so if one doesn’t exist, you won’t have to wait until you’ve started sending to find this out, and you shouldn’t have to run your list through third-party software to do so. Whether it’s syntactical errors that are the problem or bad domains, there is no reason your ESP shouldn’t automatically remove these improperly formatted and non-existent domains from your list. If your ESP isn’t already handling this, you should find another ESP immediately. As if that’s not enough, the “expert” goes on to say that leaving these addresses in your list will hurt your deliverability. How exactly would that happen? If the email address or domain is invalid the DNS system will tell you. No ISP could be contacted to deliver this email, so this bad address couldn’t possibly affect your deliverability. It could never get that far. Enter an address to gmail.moc instead of gmail.com, and Google will never here about it. The mailing will get stopped at the starting gate. But improperly formatted email addresses are only half the story. Those are pretty obvious and are usually easy to spot. More difficult to recognize are the ones that appear to be legitimate addresses in every way but will return an invalid user response. Timfeldman@gmx.com may look like a perfectly acceptable email address, but it returns an invalid mailbox error. The quickest way to find out if an email address like this one is valid is to send to it, but you’re only going to want to do that once. Some email marketing software will send to an invalid address three or four times before giving up on it. This is asking for trouble. It’s a bit like someone knocking at your door looking for someone else, and then doing it again a few minutes later, and then again. You wouldn’t like it, and neither do the ISPs, which is why each time you retry, your reputation score takes a hit. Not a big one, but they add up, and the more it happens the worse it is for your reputation score. So why do some ESPs allow more than one attempt to send to a bad email address? Mostly it’s out of laziness. Since every email client uses its own nomenclature to describe when an email isn’t valid, you can’t simply say, stop sending if you receive an “invalid user” message because the email client might decide to identify it as “invalid recipient,” “mailbox not found,” or some other variation on the message. There’s no end to the creativity of IT professionals when it comes to coming up with different ways to say exactly the same thing. To confound things more, some of these return messages are actually benign, notifying you that the mailbox is full or that the email has been temporarily rejected but is still valid. Good, enterprise-level email marketing software, such as Goolara Symphonie, can distinguish between these different messages and stop sending to invalid addresses immediately while offering other courses of action for mailings that are detained for other reasons. Less robust systems often take the shortcut and simply try three times (in case it’s just a temporary problem) and then stop (in case it’s a bad address). This solution offers the worst of both worlds. With this method, every bad address hit you receive is automatically tripled. If you have 50 bad addresses, you’ll get 150 hits against your reputation score. Likewise, if the problem is temporary (mailbox full, for example), and the resends hit the mailbox full message three times, the ESP end up quarantining a perfectly good email address that might have been okay for a later mailing. The advice column expert’s recommendation for how to handle these invalid email addresses is the last suggestion on their list, and it is as astounding as the first one: “Use an online email validation tool to validate each email address to confirm it’s [sic] deliverable.” In other words, they want you to send your list to a third-party to validate the addresses. To understand what’s wrong with this approach, let’s look at two likely scenarios. In the first scenario, you are just starting a new email sending program. At this point, you shouldn’t have many email addresses unless you bought them or engaged in some other questionable practice. As we’ve already discussed, your ESP should eliminate any addresses with obvious syntax errors and duplicates automatically, and it should check all the domains as well to make sure they are valid. At this point you can try sending to these email addresses to find out which ones are not valid. If you have a high percentage of invalid addresses you may get blocked by some ISPs, or even by your Email Software Provider, but you shouldn’t have that many addresses when you are starting your email program, so this really shouldn’t come up. If you do get blocked it is probably worth looking at your list again because now you’ve got a bigger problem than a few invalid email addresses (and, honestly, the only likely way for this to happen is if you’ve purchased a list). In the second scenario you are an established sender with a regular list of recipients. If the ESP is worth a hill of beans, every address you’ve sent to should be valid at this point, so the only questionable ones are the new addresses. Any previous bad addresses were purged when they were imported or when they were first sent to, so the only bad addresses will be those that have either gone bad since your last sending, or are new addresses on the list. People sometimes provide bad addresses. They may be mistyped, or they may be intentionally incorrect. This is inevitable. As we’ve already pointed out, the obviously bad ones should never even make it into the system, but that leaves the ones that look fine, but are still invalid. These could hurt your deliverability, but only if you have an unusually high number of them. The percentage should be very small if you are using a good ESP and sending to your recipients on a regular basis. The ISPs know that bad addresses can happen to good senders, so there is very little penalty for a small percentage of bad addresses. If you have less than one percentage of unknown users, it’s unlikely you’ll experience any deliverability problems. So why would you take the subscriber list from your established email marketing program and send them to an outside firm to have them verified? The only reason would be that your ESP has no method of cleaning your list of bad addresses. If that’s the case, it’s time to start shopping for a better Email Software Provider. This is one of the fundamental things one should expect from an ESP. Going though your email addresses one at a time in search of bad email addresses is neither the best use of your time, nor the best way to improve your deliverability. Honestly, the best things you can do for it are make sure you send at least once a month, don’t buy lists, and make sure your email marketing software knows what to do with bad email addresses. This entry was posted in Deliverability, Email marketing, List Management and tagged bad isp, domains, email syntax, email validation, list cleaning on December 10, 2014 by Jim Morton.